In summary, one could say that it was one step forward, one step sideways during European Union meetings in Brussels recently. The week of October 15 saw meetings at the EU celebrating SME Week, and at least one positive outcome of note – the signing of an agreement between the EU and UN Women to launch a joint regional program for women’s empowerment in North Africa, Spring Forward for Women. 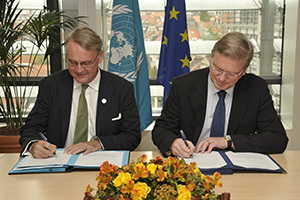 (In photo below, UN Woman Deputy Executive Director John Hendra (left) and European Commissioner for Enlargement and European Neighbourhood Policy Stefan Füle (right) sign the agreement). They also issued a warm and fuzzy news release calling for a higher level of women’s entrepreneurship and job creation, and calling attention to their Women’s Entrepreneurship Ambassador program (a wonderful example that should be emulated elsewhere, in my view). However, the news coming out of that week was a retreat from a proposal to impose a 40% quota on female representation on the boards of publicly-traded companies in Europe. The proposal has (quelle suprise!) encountered resistance from some governments, and certainly from the corporations themselves. The vote has been postponed, and may be watered down to a lower level or to voluntary targets. Change is never easy, even when the results (as research has shown) will be better decision-making, higher employee retention, and higher profits and investor ROI. As we and others have oft lamented, it’s a shame that economic participation doesn’t include any entrepreneurship measures – but there are a lack of consistent, comparable data measuring the number of women-owned firms in countries around the world. 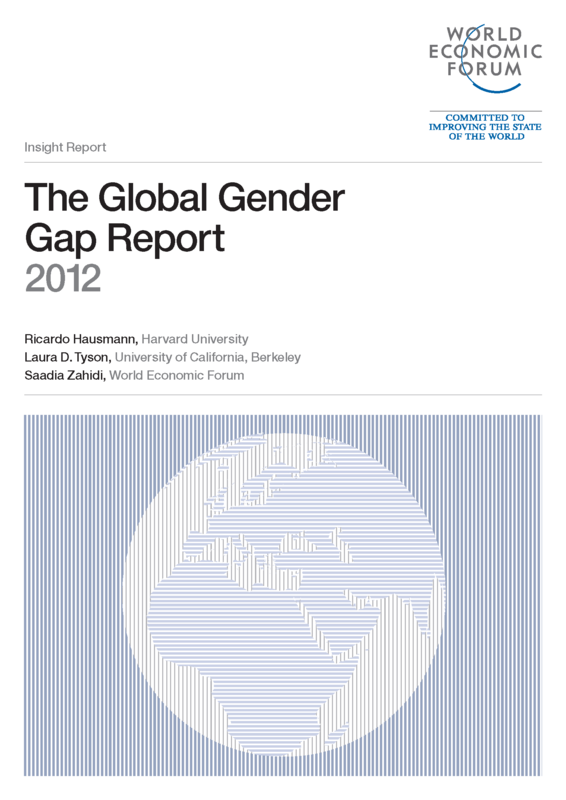 Economic participation remains an area with persistent gender gaps. And political empowerment remains the area with the consistently widest gender gap. Be that as it may, the 2012 report again shows the continuing dominance of the Nordic countries in gender equality across these measures. Iceland, Finland, Norway, Sweden, and Denmark have all ranked in the top ten in all seven years of the report – with Iceland topping the list since 2009. Three other countries have made it to the top ten in all seven years of the report as well: Ireland, New Zealand, and the Philippines. Rounding out the top ten are Nicaragua and Switzerland, both well improved from their 2006 rankings of 62 and 26, respectively. Uganda, which has advanced from a ranking of 50 to 28 over the past seven years on the heels of advancements in health and survival. Moldova has declined from a ranking of 17 to 45 as a result of slippages in political empowerment, economic participation and educational attainment. And, as we’ve seen in every year of the report’s publication, there are some countries in which persistent gender gaps exist in more than one area. Yemen, Pakistan, Chad, Syria and Saudi Arabia have remained at the bottom of the list since 2006, when 115 countries were evaluated and ranked. As has been mentioned by more than one political and social commentator, the Arab Spring has most certainly not resulted in any pervasive progress for women in the MENA region.